History doesn’t exist until its written, and popular music history doesn’t exist unless there’s evidence to back it up. There’s an implicit expectation that any scene worth our consideration will have been backed up by mass media accelerants like recordings and video clips. That’s why, until recently, Wellington’s so-called Terrace Scene was merely an obscure rumour shrouded in post-punk mythology. It was one that mainstream music fans never knew about, because you couldn't buy the LP or CD of the small but vital seam of musical expression that thrived in the Capital from roughly 1979 to 1981. You still can’t buy the CD, but factoids and some elements of the Terrace Scene’s rusted architecture have emerged out of the gloom over recent years, via Wade Ronald Churton’s 1999 history of NZ punk, Have You Checked The Children? – itself now a sought-after collectors’ item – and online fan repository UpThePunks.co.nz. Wellington was slow to adopt punk, possibly because, as Churton insists, the Capital in the late 1970s was a conservative edifice nourishing the pay packets of government drones and "Piggy" Muldoon’s oppressive regime. Churton also asserts that consequential heavy-handed police presence kept dissenters in the shadows, but I beg to differ. When I moved to Wellington in 1978, there was no punk scene to speak of, but there was a keen interest in the more avant-garde rock coming out of the UK and America. The better local record emporiums did a brisk trade in discs by freaky weirdos like Pere Ubu, Throbbing Gristle, The Residents, and so-called krautrock groups like Can and Faust, and a year or so later, the work of the more experimental English post-punk bands began flying out the door: The Fall, Gang Of Four, Cabaret Voltaire, The Pop Group, and of course, Public Image Ltd. Yes, there was a conservative pub rock scene in Wellington, but in my view, punk never really took hold in the city because it was itself a musically conservative, albeit highly energised, revision of old-time rock and roll values. Wellington youth also mainly came from economically comfortable, stable families of bureaucrats, and many of them were headed to university or art studies, so the original wave of punk, which required claims of working class credibility and eschewed anything reeking of pretention, would not have appealed. That’s why, in 1978, when a televised punk show was mounted at the Wellington Town Hall, all but one of the bands was imported from Auckland, and despite much hype, local audiences were bored by their antics. It was a year later, in 1979, that the Terrace Scene began evolving. Cheap flats abounded on The Terrace, and many of them were huge run-down, two-storied old villas that proved perfect for parties, small gigs, and as a floor to crash on. Numbers 212 and 246 are said to have been the legendary home of the original Terrace Scene, and between 1979 and 1981 they were the temporary digs for many long-term and itinerant musicians, artists and freeloaders and, inevitably, crooks and drug dealers. 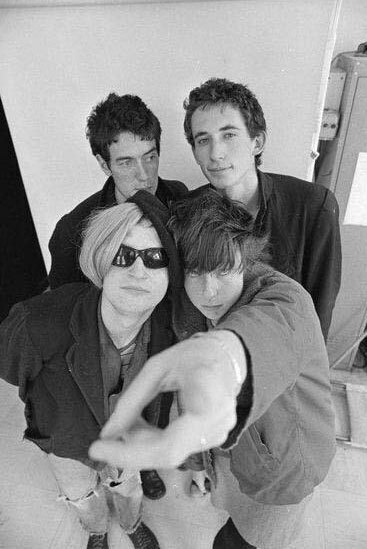 Although not everybody lived on The Terrace, or was strictly part of the scene, it became synonymous with any music born of the same inherent aesthetic: Informed by a politically conscious, left-leaning punk rock aesthetic, but musically and stylistically divergent. The Terrace Scene bands encompassed the X-Ray Spex-type proto-punk of The Wallsockets, the wildly deviant theatricality of Life In The Fridge Exists, the hypnotic moodiness of Naked Spots Dance, the introverted ruminations of Beat Rhythm Fashion, and a little later, the overt political activism of Riot 111. But towering above all the rest were Shoes This High. Three quarters of Shoes This High came from The Amps, a group who in 1978 had formed around the nucleus of vocalist Brent Hayward, guitarist/bassist Chris Plummer and guitarist Kevin Hawkins. 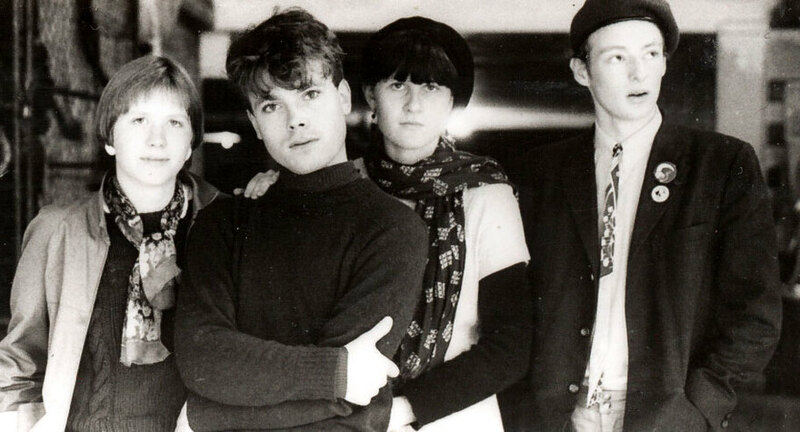 Formed in September 1979, Shoes This High saw Plummer become the drummer, and Jessica Walker (sister to Toy Love’s Jane) take over bass duties. The group’s all-original repertoire was an extreme riot of atonal guitar riffs working in circular motion with Walker’s gut-churning, dubby bass and Hayward’s antagonistic, incantatory vocal repetitions. It was an extreme brew of wild avant guitar scree, punk vocals and rhythmic fortitude, and we’ve not seen its like before or since: Kind of like Captain Beefheart’s Magic Band with a punk version of Charles Manson on vocals. Also of merit was Beat Rhythm Fashion, comprised of Hong Kong-raised sons of a diplomat, Dan and Nino Birch, together with new habitué of the drum stool seemingly every other moment. 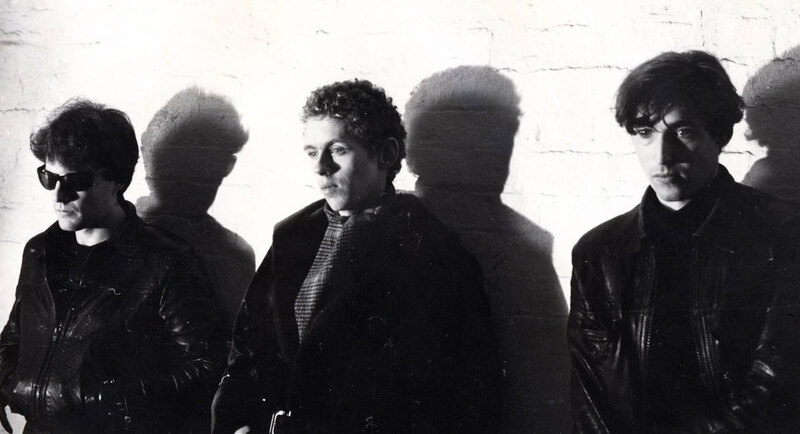 Closer to the primal vocal urgency of John Lennon than punk, the duo’s music betrayed a huge debt to The Cure (whose first two albums were huge in Wellington), but managed to avoid mere imitation through their artfully constructed songs and lyrics. Naked Spots Dance were similarly slightly dour, and art-oriented, but on a good night, their extended mantric grooves could hypnotise. The band’s core was guitarist Steven Norris and bassist Kate Walker, while over its four-year tenure, there was a revolving cast of drummers and singers. Notable for the fact that their three main singers (actors Jennifer-Ward Lealand and Katherine McRae, and screenwriter/Sir Peter Jackson’s wife Frances Walsh) later became notable personalities, NSD was really a hippie/punk collision, mixing a bit of Jefferson Airplane’s agit-prop folk-rock with doom-laden post-punk and later, a bit of ACR’s clipped funk. Life In The Fridge Exists, in contrast, was a shambolic, short-lived rock theatre helmed by psych-ward worker/artist Michael Gallagher, with help from Sue Forbes (vocals), familial duo Samantha (vocals) and Nick Swan (guitar), and whoever else happened to be around. Their notoriety ensured they would be remembered: who could forget their campaign against the hapless Phil O’Brien, who had just replaced Dr Rock on Radio With Pictures? Their ‘Phil O’Brien Song’, which encouraged crowds to scream “Phil! Wanker! Wanker! Wanker!” probably still has poor O’Brien waking up in cold sweats in the dead of night. And who could forget the song ‘Have You Checked The Children?’, where the two young women taunt their parents with the information that they’re working in saunas. And they were. Then there was The Wallsockets, a band whose own music was an already-dated style of punk in 1979, but whose pragmatic endeavours worked as a kind of unofficial management device for the whole scene. It was The Wallsockets who organised the run-down Thistle Hall as a venue for the nascent scene at a time that hiring venues or getting gigs in pubs or clubs was almost impossible; it was The Wallsockets who negotiated with the Wellington Council for a series of Sunday afternoon gigs at Cuba Mall; and it was The Wallsockets who got it together to arrange the only real recorded evidence of the scene ever released: the legendary **** – known as Four Stars – compilation. 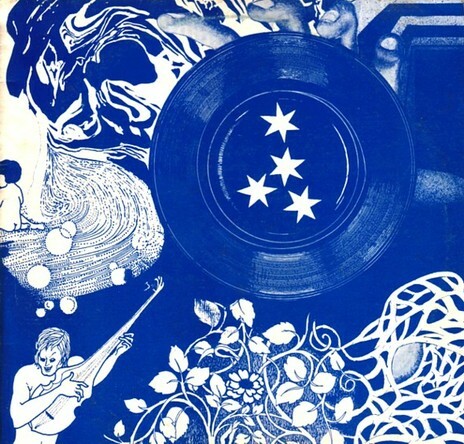 This album, which featured rough and ready 4-track recordings of The Wallsockets, Beat Rhythm Fashion, Life In The Fridge Exists and Naked Spots Dance, was released in November 1980 and, together with the Shoes This High EP (released February 1981), provided the first evidence of a DIY independent ethos in NZ. But Wellington was no oasis of arty post-punk cool. It’s always been a town with a young population that’s passing through, going north, going south, or going overseas. The Terrace Scene was also fuelled by its contact with likeminded musicians from Auckland (notably The Features) and Christchurch (importantly, George Henderson and The Spies/And Band, and The Gordons), and even Shoes This High moved to Auckland in the end, where they shared a house with The Gordons until the group inevitably self-destructed. The scene itself dissipated markedly through 1981, but there was a sea change underway. Wellington’s streets turned mean around the time of the infamous Springbok tour, gigs became even harder to organise, and inevitably, skinheads would turn up to fight with anyone who wasn’t a skinhead, and then the police would arrive and close gigs down. Amidst this turmoil, Void and his band Riot 111 issued the single ‘1981’, which Churton describes as a “savagely barked English translation of Te Rauparaha’s war-chant haka.” This was highly politicised and effective anger-punk, but musically, it was a step backwards. Churton mentions the unrest in his book, but doesn’t mention the drugs, which sapped the life out of the Terrace Scene, and in time, killed off key members of its cast, including Kevin Hawkins (Shoes This High) and Samantha Swan (LIFE). Brent Hayward talks about STH being ardent users of datura, a dangerous hallucinogenic, and sadly, use of such substances (along with more addictive ones) was rife, but the drugs fitted the nihilism of the scene, and the sense that we were in apocalyptic times. There’s not much to show for the Terrace Scene now – poor quality YouTube dubs of the Radio With Pictures documentary made by Chris Knox in 1980, a few tinny sound files on the internet – but we can hope that some day the impossibly rare **** will get a re-release, along with some of the killer live tapes that exist of bands like Shoes This High and its short-lived sequel, Fishschool. Other names from Wellington’s punk/post-punk scene: The Digits, The Normals, The Steroids, The Ambitious Vegetables, The Red, Perfect Strangers, First Fifteen. A peak moment for the Terrace Scene was the three-day Queen’s Birthday Weekender at Billy the Club in 1980, which featured 14 bands including Auckland’s The Features, Shoes This High, and all the usual suspects. 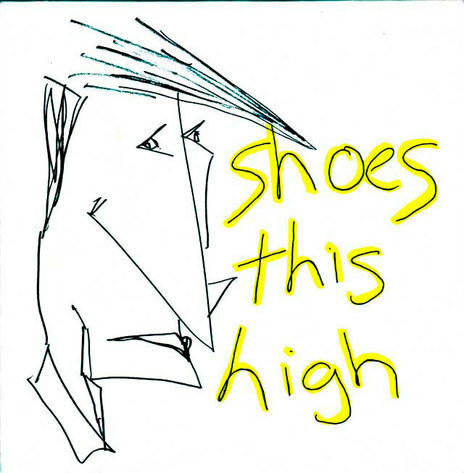 The Shoes This High EP was recorded at Harlequin Studios in Auckland on December 21, 1980, and released in February 1981, and quickly sold out its small run. A facsimile copy was reissued on red vinyl in 2002, with liner notes by this author. Naked Spots Dance ended up being the most prolific of the Terrace Scene bands, releasing two 12-inch EPs and an album, as well as featuring on ****. Lord Of The Rings screenplay writer Frances Walsh was a member of The Wallsockets, and later, sang for the last version of Naked Spots Dance. The last version of pre-Shoes This High group The Amps featured Invercargill-born George Henderson, previously of Smack Attack, on Farfisa organ. He is quoted as saying: “One prophetic day, Richard and me sold some drugs to a guy called Kevin Hawkins, and learned that he had this band with a fluctuating lineup and that he needed another musician, and I had a Farfisa keyboard.” Henderson went on to form The Puddle in Dunedin. 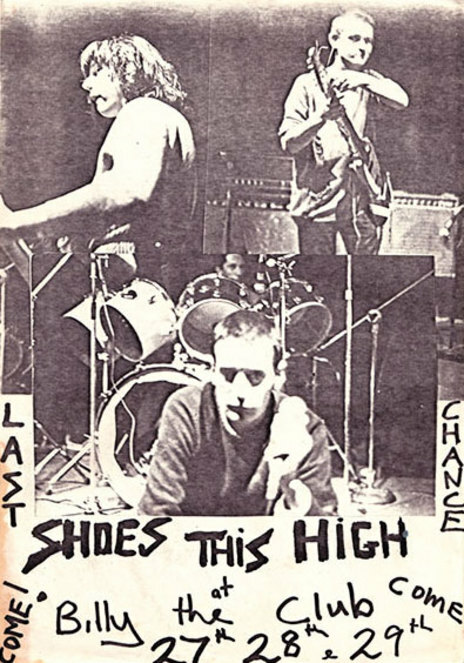 Hawkins formed Fishschool after Shoes This High, then performed solo as Screamin’ K Hawkins (his version of Henderson’s ‘Song With No Future’ can be heard on The Last Rumba, Flying Nun, 1983). He died from a drug overdose in 1989. Brent Hayward from Shoes This High went on to assume a number of artistic personas over the years, including Smelly Feet, Kiwi Animal, The Reverend Stinkfinger, and Fats White, his current moniker. He is also an acclaimed maker of experimental films, a painter, and a professional provocateur. Sam Swan was infamous for ability to taunt and provoke, and during Gary Numan’s 1980 concert in Wellington, she managed to gob a big juicy bit of phlegm smack dab on his face. She later moved to Auckland, where she performed in ?Fog and Robert The Record, and died of an overdose in 1993.